The Iguanodon is an ornithopod dinosaur. This very prolific dinosaur was one of the first scientifically well known specimens, and is found in several localities in Europe, Asia, Africa and North America. This somewhat strange looking dinosaur is distinguished by large thumb spikes, which may have been used for defense against predators. Iguanodon was able to walk in a bipedal or quadrupedal position. When this dinosaur was first discovered and mounted it was believed that its thumb spikes were horns, that it dragged its tail and was strictly a quadruped. The Crystal Palace was the first dinosaur park and exhibition. The dinosaurs displayed in the park were built by Benjamin Waterhouse Hawkins, under the advisory of Sir Richard Owen. This historic model was sculpted by Japanese Paleo-Artist and Sculptor Kazunari Araki. 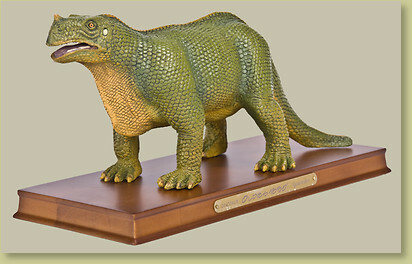 This fascinating model is an excellent addition to any dinosaur collection or all by itself. Collect all the Oldies Desktop models available in the Favorite Collection line of historic dinosaur models. Source # FDA-56 - FAVORITE COLLECTION ITEMS ARE FRAGILE. HANDLE WITH CARE. KEEP ALL PACKAGING IF ITEM ARRIVES BROKEN. A FULL REFUND WILL NOT BE ISSUED IF ITEM IS BROKEN AND PACKAGING IS NOT KEPT. UPS WILL PICK UP BROKEN ITEMS. Notes BHI is a U.S. distributor of Favorite Collection products. If you are a retailer and would like information about carrying these products, please contact our sales department.